hydraulic automatic copper aluminum busbar cutting punching bending machine 303 503ESK 03.jpg Working Unit: Bending, punching and cutting, can work in the same time. Material Processed: Brass/ Copper busbar and Aluminum busbar. Function: 1.bending at vertical and horizontal direction. 2.punching for round and oblong hole. 3.cutting busbar. 4.special for embossing, knurling, twisting, cable joints pressing. Features: 1.Low maintenance, longer service life. 2.The cut surface is smooth and neat, no droop, no burrs, no waste. 3.Rotary turret punching unit installed 6pc (4pcs and 8pcs ) dies, less replacing, high efficiency. 4.It can punch cut and bend in the same time. 5.Contacted by PLC system, bending precision at ±1°, repeat precision at ±0.3°. 6.Easily to be moved with four casters. 7.Manual button and foot switch are optional. 8.Can customize the punching dies you need. 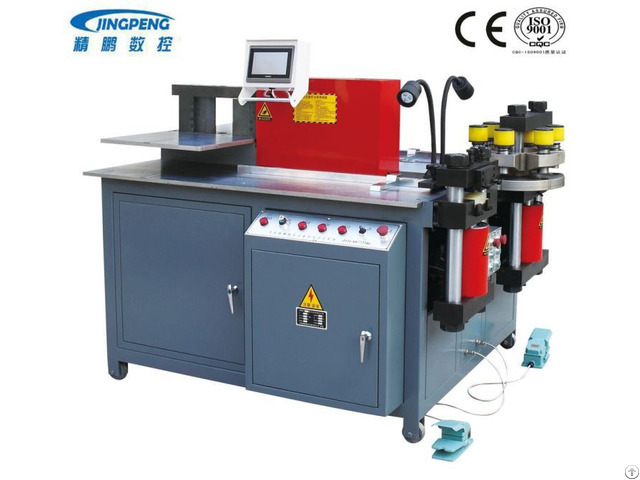 Punching unit 002.jpg Bending unit 001.jpg Cutting unit 002.jpg Our busbar machine can cut or shear, bend and punch copper and aluminium busbar with three stations working at the same time. This will largely improve your productivity.It is widely used in switchgear and power transformers production. The advatange: (1). Turret rotate punch, no need change dies, high efficiency, save time. (2). Cutting without any waste, save busbar. cutting adge very flat. (3). Bending precision. (can make vertical / horizontal / U shape bending ) (4). Our busbar machine os easily to operate and learn, especially for the freshman. busbar samples 01.jpg Our factory 01.jpg exhibition trade show 01.jpg packaging 04.jpg We are the biggest manufacturer for busbar processing machine in China. The MANUFACTURE of high quality busbar machine with competitive price, we have. In order to attract more customers and to extend product influence, our company offers the machines` factory prices. Business Description: Our main products include CNC multi-function busbar processing machine, non-cnc busbar processing machine, combined economical busbar machine, CNC busbar punching and shearing line, CNC busbar bending machine, CNC busbar chamfering machine, CNC sheet metal cutting machine. Our equipment are widely used in the industries of high and low voltage switch cabinet, switchgear, transformer, transformer station, electric switch, communication equipment, household appliances, shipbuilding and elevator manufacturing etc.